A ropes course with a view of the Charles Point Marina. 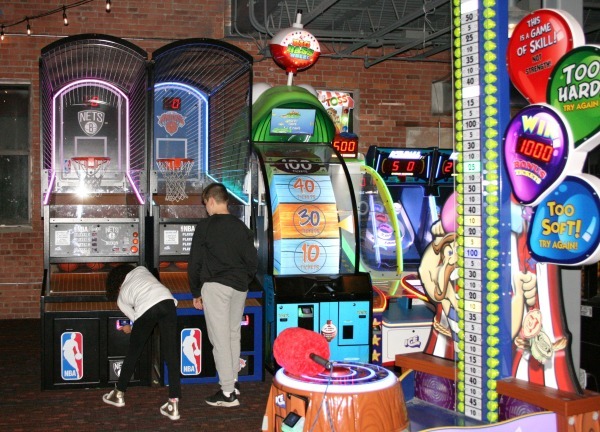 Northern Westchester has a new 40,000 square foot entertainment venue offering an indoor and outdoor ropes course, arcade, laser tag, plus, indoor bocce and shuffleboard courts. It’s all about the climb. That’s the great draw to this uniquely located activity center. There’s nothing like it in the immediate vicinity, cleverly carving a nice little niche for itself in Peekskill and surrounding regions. 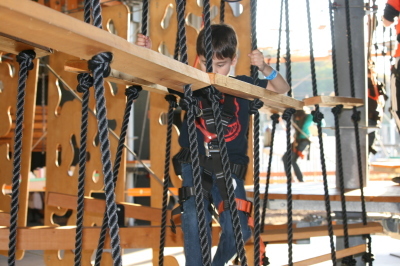 The indoor ropes course is fantastic for kids who are five and older. It’s challenging enough for adults as well. 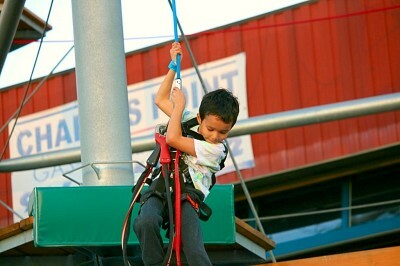 Thrill seekers will naturally gravitate to the outdoor option. With four levels and over 70 elements to test your strength and grit, even some devoted gym rats may walk away from the course determined to handle unfinished business on their next visit. Be forewarned, acrophobia may take hold in a person who has never experienced a fear of heights. Especially, when the intellect chimes in wondering why one is balancing on a bike in midair. 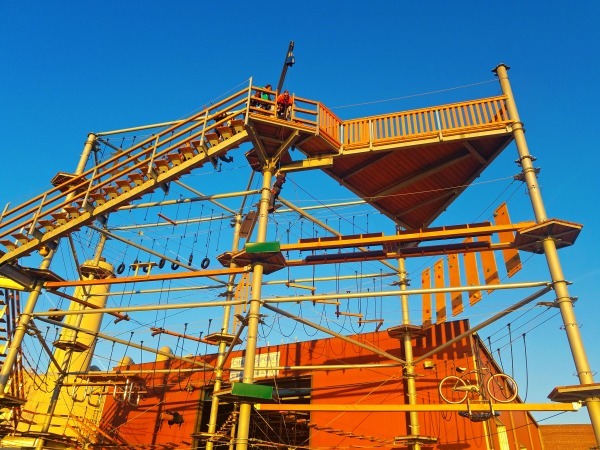 It’s the combination of the mental and physical demands on the body that makes the ropes course a must-do activity for adventurers. The striking Hudson River view from that altitude is the mic drop moment further elevating the experience. Compared to other super-sized entertainment facilities in neighboring counties, Spins Hudson offers less, but the quality is certainly there. Kids will easily while away hours at play. 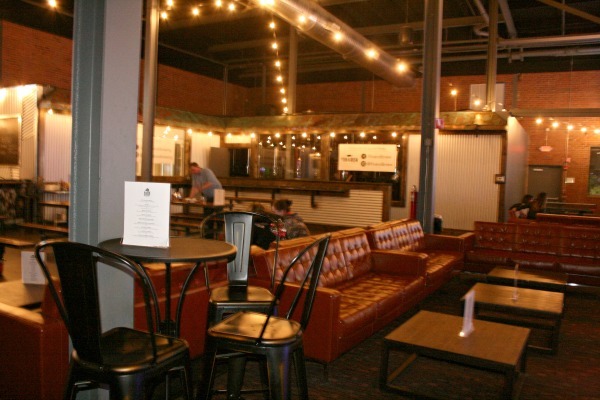 Parents can choose to participate in the games or enjoy the lounge-like setting offered in the bar section of the facility. Basic alcoholic drinks, such as wine and beer, are on the menu, as well as, a tasty assortment of appetizers, which my friends and I sampled and devoured. The couches alone are comfortable and inviting for an adult who wants to kick back and watch a game on one of the giant flat screens hanging overhead in the spacious hall. 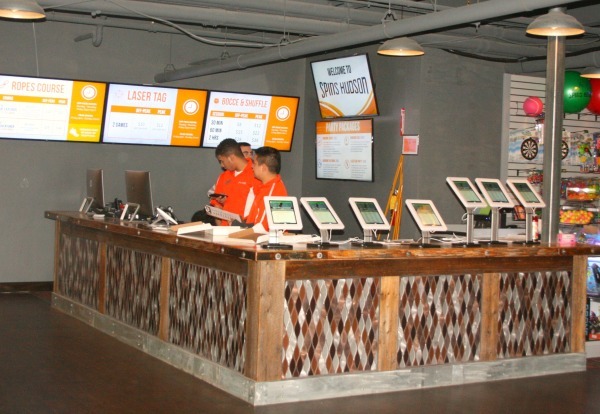 Waivers to do the ropes course can be filled out online or at the reception desk when you enter. Party pricing starts at $350 for 10 guests doing the ropes course, including pizza and a beverage. From there, rates increase depending on the number of guests and activities customers wish to add to their event package. Spins Hudson is open Thursday - Sunday.